There is a town in front of us, on the banks of the Danube, in between the Great Plane and hills. How did the seat of Hungarian kingdom end up being built on the center of Roman Province, in Aquincum. How did it perish during Ottoman wars? How did Pest, Buda and Óbuda end up fusing, and how did the town become one of the fastest developing metropolises in Central Europe at the turn of the 19th to the 20th century? How did WWII demolish the city and how did Grand Budapest shape? The exhibition follows chronological order when presenting the history of Budapest, from the antique times to the change of social system. The build up of the material follows the motion of a river. The corridor winds just like the River Danube does. The primary concept was to follow the town that was demolished then rebuilt so many times in the past. The title ‘Light and Shadow’ suggests the times when the town flourished, wars that interrupted development, natural catastrophes, then reconstruction after the devastation. Social, architectural or economic characteristics of Budapest are revealed and may explain why and how Buda became the most exciting town in Central Europe. The material also consists of diaries of people who described their experiences with Budapest. The exhibition is also interactive, with many technologies involved: large screens, digital pictures, headsets, touch-screens where they can find excavations sites and see photos of them etc. By the spring of 2012 we hope to have the second part of the exhibition ready, with thematic units branching from the body material. 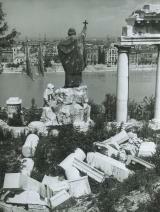 In February of 1974, unexpectedly a group of statues was unearthed. These artworks had been made for the Court and were believed to have been lost. The series of statues found were the artworks of royal artists. The exhibition is arranged by the vertical time axis scale in the downstairs room of the main house.